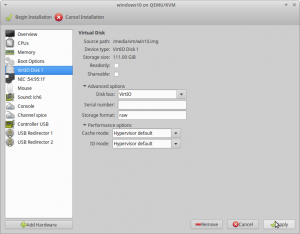 The intent of this document is to provide a complete, step-by-step guide on how to setup a virtual machine(VM) with graphics cards(GPU) passthrough – detailed enough that even Linux rookies are able to participate. The final system will run Xubuntu 18.04 as host operating system(OS), and Windows 10 as guest OS, considering gaming as main use-case of the guest. I am still very happy with my distro choice (Xubuntu), but I have to emphasize that (X)Ubuntu (or any Debian based distro) is not the easiest distribution to perform virtual machine passthrough. Most of the guides I found online were targeting either Fedora or Arch as the host operating system. Especially Fedora 26 should be easy to setup for passthrough (as recommended by level1techs). 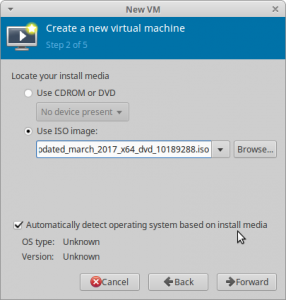 In order to successfully follow this guide, it is mandatory that the used hardware supports virtualization and IOMMU groups. When composing the systems hardware, I was eager to avoid the necessity of kernel patching. 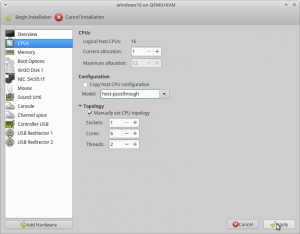 The ACS patch is not required for the given combination of processor and mainboard. The Nested Page Tables(NPT)-bug has been fixed in Kernel version >4.15rc1 (Dec. 2017). Make sure your BIOS is up to date. I installed Xubuntu 18.04 x64 (UEFI) from here. I used the 4.19.5 kernel, installed via ukuu. *since version 19.01, needs a paid license. Any kernel version from 4.15 should work for a Ryzen passthrough. In Ubuntu 18.04, Xorg is still the default display server – I use it with the latest Nvidia driver (415) in order to have proper graphics support on the host. Additionally, I like to use QEMU in verison 3.1 or higher. Unfortunately, Ubuntu 18.04 ships with version 2.11. If you want to use a newer version (3.1 in my case) you have to build it first. This is basically copy and paste from the excelent reddit post by liquify. It was suggested to use checkinstall in order to create an .deb-file and install it via aptitude (this would for example automatically take care of the apparmor configuration). Unfortunately, I was unable to get this working. Thus I sticked with the original post by liquify. Atleast the build version will not compromise the distro managed version. 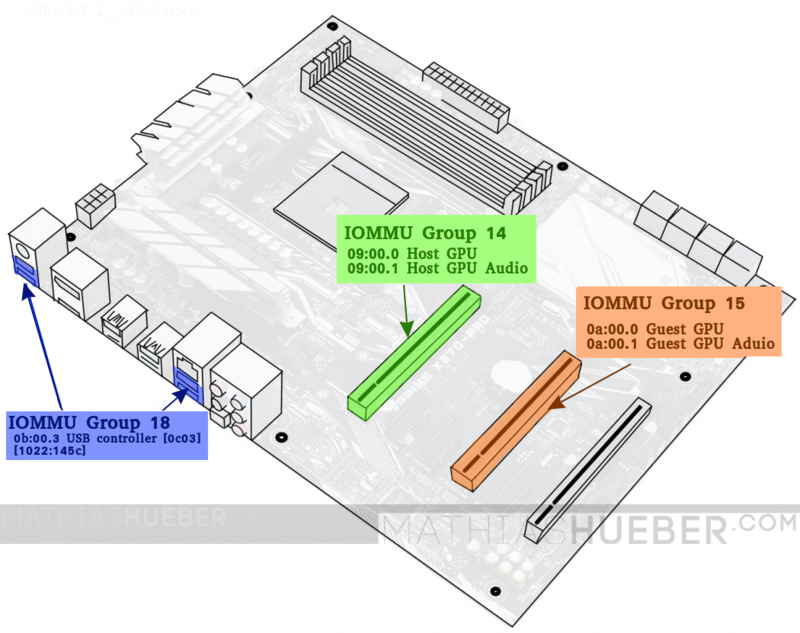 Devices connected to the mainboard, are members of (IOMMU) groups – depending on where and how they are connected. It is possible to pass devices into a virtual machine. Passed through devices have nearly bare metal performance when used inside the VM. On the downside, passed through devices are isolated and thus no longer available to the host system. Furthermore it is only possible to isolate all devices of one IOMMU group at the same time. This means, even when not used in the VM if a devices is IOMMU-group sibling of a passed through device, it can not be used on the host system. Modify the grub config: open sudo nano /etc/default/grub and edit it to match: GRUB_CMDLINE_LINUX_DEFAULT="amd_iommu=on iommu=pt kvm_amd.npt=1" afterwards use: sudo update-grub and reboot your system. Attention:After following the upcoming steps, the guest GPU will be ignored by the host OS. You have to use a second GPU for the host OS. 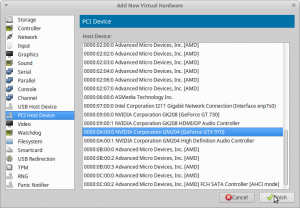 In order to activate the hardware passthrough for virtual machines, we have to make sure the nvidia driver is not taking ownership of the PCIe devices; isolate it before we can hand it over. This is done by applying the vfio-pci to the guest GPU, during the system startup. We are looking for the device id of the guest GPU and a suitable USB controller for isolation. Keep in mind that the GPU usually comes combined with an audio device. We will isolate the GPU in PCIe slot 2, and the USB-controller from group 18 see figure 1. For the next step only the GPU-Id is needed. We have to isolate 10de:1b83 and 10de:10f0. The USB-controller Id (1022:145c) is later used. These changes will pass device-ids to the vfio_pci module, in order to reserve these devices for the passthrough. It is crucial that the vfio_pci module claims the GPU before the actual driver (in this case the nvidia graphic-cards driver) loads, otherwise it is not possible to isolate the GPU. Make sure your cards are using the Nvidia driver (not nouvea one). Obviously, the ids have to be the same we have added before to the modules file. Now save and close the file. Attention: After the following reboot the isolated GPU will be ignored by the host OS. You have to use the other GPU for the host OS NOW! find the line "Kernel driver in use" for the GPU and its audio part. It should state vfio-pci. 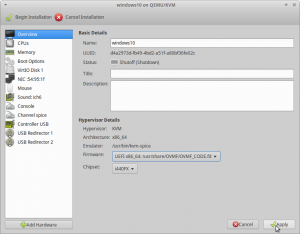 The virtualization is done via an open source machine emulator and virtualizer called QEMU. 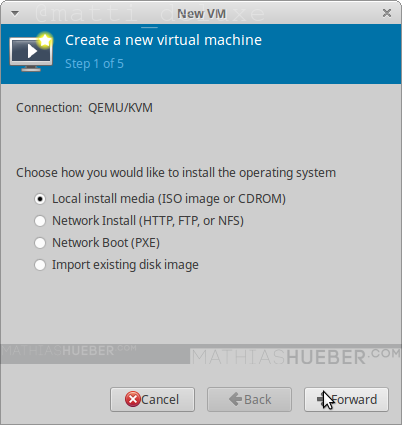 One can either run qemu directly, or use a GUI called virt-manager in order setup, and run a virtual machine. I prefer using the GUI. Unfortunately not every settings is supported in the Virtual Manager. Thus, I define the basic settings in the UI do a quick VM start and force stop it right after I see the GPU is passed-over correctly. Afterwards one can edit the missing bits into the VM config via virsh. 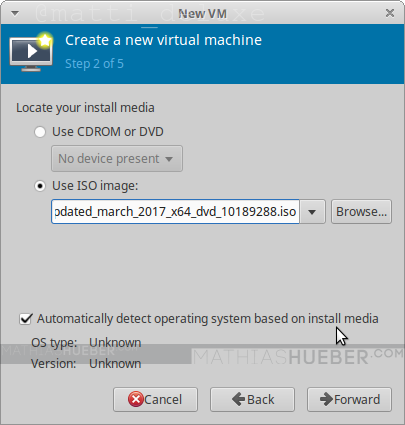 Make sure you have your windows iso file, as well as the virtio windows drivers downloaded and ready for the instalation. As I said, lots of variable parts can add complexity to a passthrough guide. 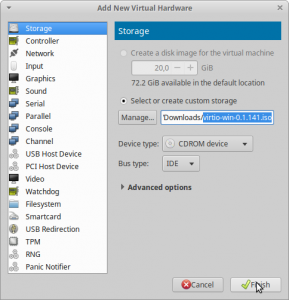 Before we can continue we have to make a decision about the storage type of the virtual machine. In this guide I use a raw image container, see the storage post for further information. The 111G were set in order to maximize the size of the image file and still fit on the 120GB SSD. 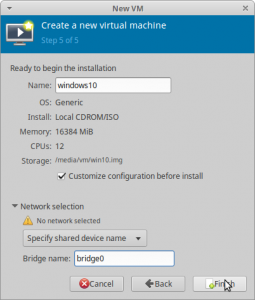 We will use a bridged connection for the virtual machine. This requires a wired connection to the computer. I simply followed the great guide from heiko here. see the ethernet setups post for further information. 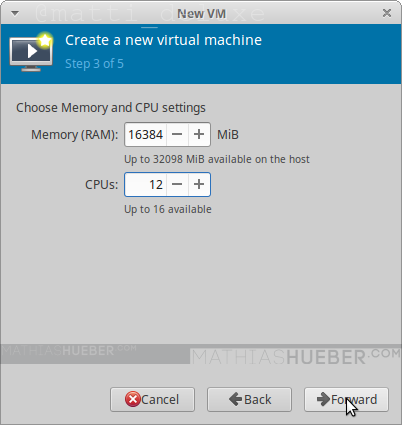 As said before we use the virtual machine manager GUI to create the virtual machine with basic settings. 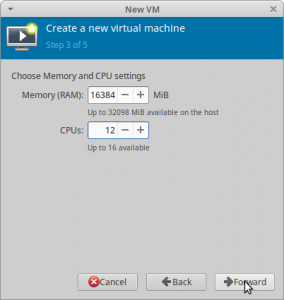 In order to do so start up the manager and click the “Create a new virtual machine” button. Select “Local install media” and proceed forward (see figure 2). Now we have to select the windows iso file we want to use for the installation (see figure3). Also check the automatic system detection. Hint:Use the button “browse local” (one of the buttons on the right side) to browse to the iso location. Figure3: Create a virtual machine step 2 – select the windows iso file. Put in the amount of RAM and CPU cores you want to passthrough and continue with the wizard. 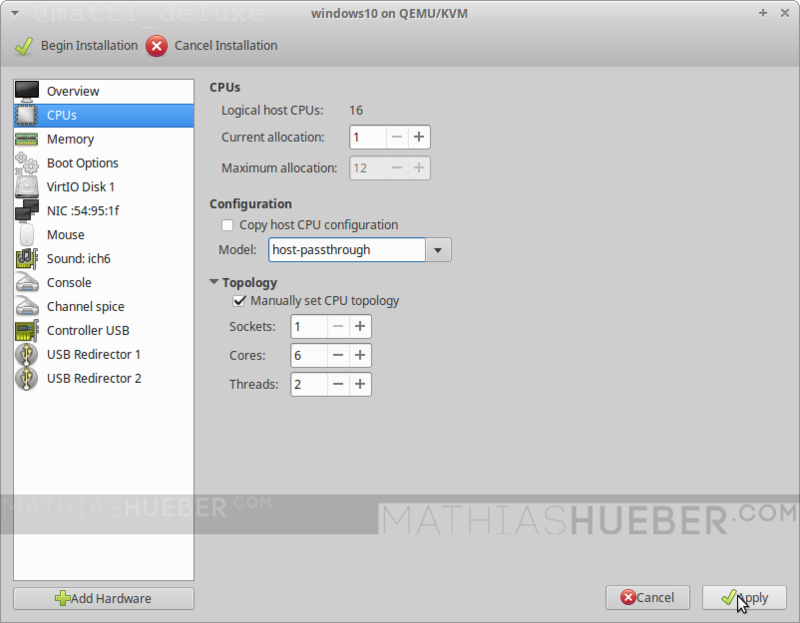 I want to use 12 Cores (16 is maximum) and 16384 MiB of RAM in my VM. Here we have to choose our previously created storage file and continue. 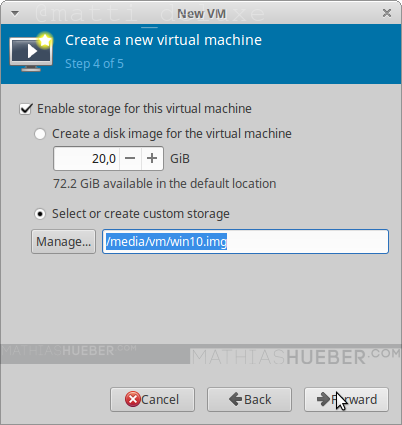 Figure5: Create a virtual machine step 4 – Select the previous created storage. On the last steps are slightly more clicks required. Put in a meaningful name for the virtual machine. This becomes the name of the xml config file, I guess I would not use anything with spaces in it. It might work without a problem, but I wasn’t brave enough to do so in the past. Furthermore make sure you check “Customize configuration before install”. For the “network selection” pick “Specify shared device name” and type in the name of the network bridge we had created previously. You can use ifconfig in a terminal to show your ethernet devices. In my case that is “bridge0”. 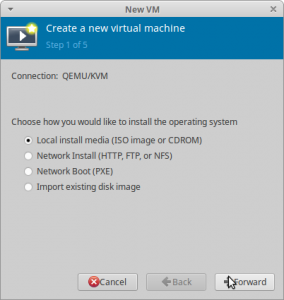 Figure6: Create a virtual machine step 5 – Before installation. Once you have pressed “finish” the virtual machine configuration window opens. The left column displays all hardware devices which this VM uses. By left clicking on them, you see the options for the device on the right side. You can remove hardware via right click. You can add more hardware via the button below. Make sure to hit apply after every change. The following screenshots may vary slightly from your GUI (as I have added and removed some hardware devices). On the Overview entry in the list make sure that for “Firmware” UEFIx86_64 [...] OVMF [...] is selected. “Chipset” should be i440FX see figure7. For the “Model:” click in to the drop-down, as if it is a text field, and type in host-passthrough. When you first enter this section it will say “IDE Disk 1”. We have to change the “Disk bus:” value to VirtIO. 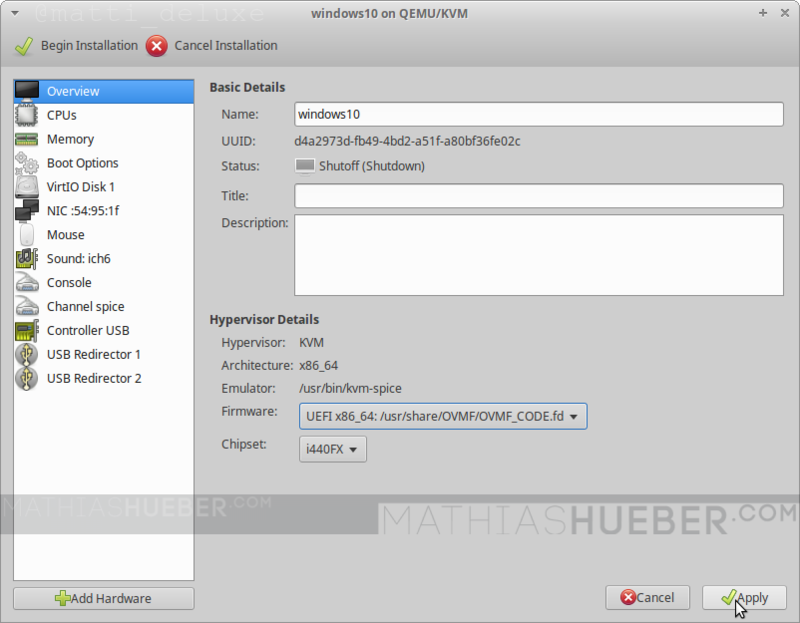 Next we have to add the virtIO driver iso, so it be used during the windows installation. 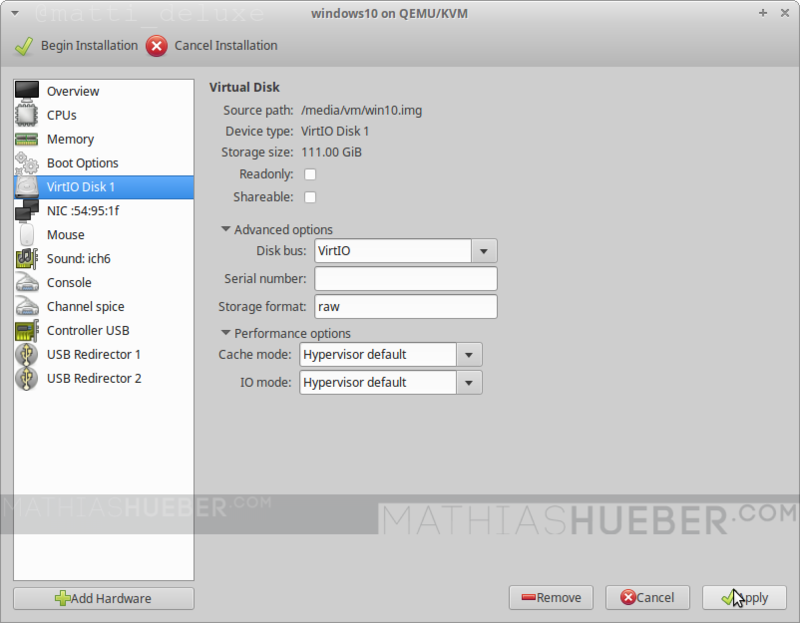 Otherwise the installer can not recognize the storage volume we have just changed from ide to virtio. In order to add the driver press “Add Hardware”, select “Storage” select the downloaded image file. For “Device type:” select CDROM device. For “Bus type:” select IDE otherwise windows will also not find the CDROM either 😛 (see Figure10). 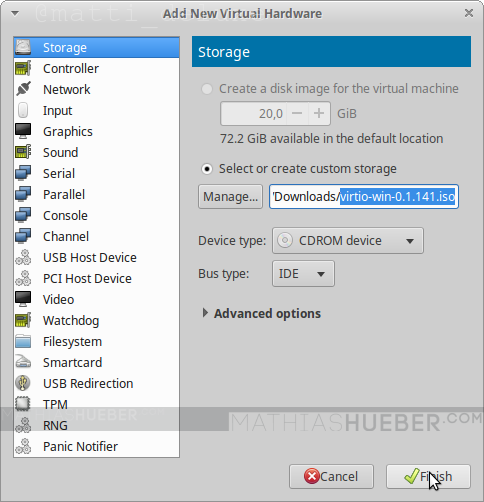 Figure10: Virtual machine configuration – Adding virtIO driver CDROM. Figure11: Virtual machine configuration – Adding PCI devices (screenshot is still with old hardware). Remark: In case you later add further hardware (e.g. another PCIe device), these IDs might/will change – just keep in mind if you change the hardware just redo this step with updated Ids (see Update 2). This should be it. Plugin a second mouse and keyboard in the USB ports of the passed through controller (see figure1). Hit “Beginn installation”, a Tiano core logo should appear on the monitor connected to the GTX 970. If a funny white and yellow shell pops-up you can use exitto leave it. When nothing happens, make sure you have both CDROM device (one for each iso windows10 and virtIO driver) in your list. Also check the “boot options” entry. 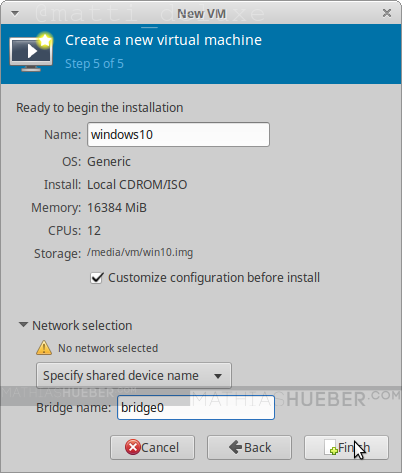 Once you see the windows installation, use force off from the virtual machine manager to stop the VM. I rewrote this section in a separate article – see here. This step is optionaland requires previous setup: See the Hugepages post for details. Attention:Make sure <memoryBacking> and <currentMemory> have the same indent. This guide uses an Nvidia card as guest GPU. Unfortunately, the Nvidia driver throws Error 43 , if it recognizes the GPU is being passed through to a virtual machine. I rewrote this section and moved it into a separate article. After some sleepless nights I wrote an separate article on that matter. 2019 – 02- 08 – Fixed typo and added a remark about paid licenses for ukuu. Thank you for this, I’m a newbie to this topic and have a question regarding Groups, when I run the bash script, the NVIDIA card I hope to isolate and passthrough seems to be grouped with many other USB and SATA controllers…is this problematic? My MB is a Gigabyte AB350M-Gaming3. I would appreciate your advise for how to proceed with this. Thank you. I see no other groups for USB ports that aren’t already accounted for in Group 12. Well, if you want to passthrough Group 12, you have to pass all device to the VM. Considering your output I would try to pass Group 13 to the VM if that is possible. I have no experiences with the Gigabyte AB350M-Gaming3, have you tried looking for other passhtrough success stories with said MB? indeed you are correct. I had updated the first ID, but forgot to change the Definition Audio Controller id as well. Good catch – thank you! I have a 1700x and whenever I use 2 threads it tells me “qemu3.1-system-x86_64: warning: This family of AMD CPU doesn’t support hyperthreading(2)” I’m using qemu 3.1, anything I need to do ? sorry for the delayed reply… I am lazy with these comments. Does the problem still exists? If so, have you used “kvm ignore_msrs=1” ? You can email me your VM xml if you want, so I can have look at it.